Scientists at NASA's Jet Propulsion Laboratory, Pasadena, Calif., used simulations to show that the first stars, during their formation, had a greater impact on surrounding gas than previously thought. The first stars that were forged in our early universe were not nearly as massive as once thought, according to the results of a new study. Astronomers at NASA's Jet Propulsion Laboratory in Pasadena, Calif., used computer simulations to artificially create the conditions of the early universe to "grow" stars during this primordial stage. The simulations, which took weeks, yielded shocking results: the full-grown stars were not the behemoths that the researchers were expecting. "The first stars were definitely massive, but not to the extreme we thought before," study leader Takashi Hosokawa, an astronomer at JPL, said in a statement. "Our simulations reveal that the growth of these stars is stunted earlier than expected, resulting in smaller, final sizes." Previously, it was widely thought that the first stars were the biggest of all, hundreds of times more massive than our sun. Instead, the new findings show that these early stars are only tens of times the mass of the sun. In fact, one star from the researchers' simulations was only 43 times the mass of our sun. Details of the study will be published online in tomorrow's (Nov. 11) issue of the journal Science. The early universe consisted of only thin clouds of hydrogen and helium atoms. It would take several hundred million years for the first stars to form. But how these stars ignited is still a mystery. Heavier elements were created and dispersed throughout the universe as stars were formed, but in the primordial universe, these heavy elements had yet to be produced. So, the very first stars had to have been formed out of nothing but hydrogen and helium, the researchers said. As a result, scientists theorized that the first stars would need even more mass to form, in order to compensate for the lack of heavy elements and their cooling power. It was first thought that the stars could be as big as1,000 times the mass of our sun, but these models were later refined, and the commonly accepted estimate was that these early stars were hundreds of solar masses, the researchers said. "These stars keep getting smaller and smaller over time," Takashi said. "Now we think they are even less massive, only tens of solar masses." Scientists are simulating how the very first stars in our universe were born. This diagram shows a still from one such simulation. The cube on the right is a blown up region at the center of the box on the left. 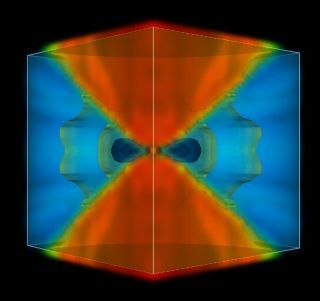 The new simulations show that matter surrounding the new stars heats up to scorching temperatures as high as 90,000 degrees Fahrenheit (almost 50,000 degrees Celsius) — hotter than previously thought. At these temperatures, which are 8.5 times hotter than the surface temperature of the sun, gas expands and escapes the gravity of the developing star, instead of falling back down onto it. This means that the growth of these stars is stunted earlier than predicted, which could explain why they appear to be smaller. "This is definitely going to surprise some folks," Harold Yorke, an astronomer at JPL and a co-author of the new study. "It was standard knowledge until now that the first stars had to be extremely massive." The findings also shed some light on the mystery of the first stellar explosions, called supernovas. When massive stars run out of nuclear fuel, they end their lives in violent supernova explosions that emit brilliant light and spew star guts made of heavier elements into space. If the first stars were indeed as monstrous as thought, these supernovas should have left a specific pattern of these heavy elements imprinted on the material of the following generation of stars, which were built from the ashes expelled from the first supernovas. But, as much as astronomers searched the oldest stars for this pattern, they could not find it. The results of this new study suggest that the signature is simply not there, the researchers said. Since the first stars were not quite as massive as previously thought, they would have blown up in a manner similar to the types of supernova explosions we see today. "I am sure there are more surprises in store for us regarding this exciting period of the universe," Yorke said. "NASA's upcoming James Webb Space Telescope will be a valuable tool to observe this epoch of early star and galaxy formation."